People who have followed my blog over the years might be aware that in 2012 my lower back decided to suddenly and loudly let me know it was not happy. This experience led to various adventures involving insurance companies, doctors, physical therapists, surgeons, my amazing wife Cynthia, and wonderful friends. For five years I have been able to work between one-third and half the time in the shop I had previously. This meant I have made far fewer dulcimers and each dulcimer required more gaps in time between start and finish. I have found this frustrating but I also believe everything that happens is a gift, though some gifts I would not have asked for and if possible I would return or exchange them. One of the gifts of the last 5 years has been the chance to reevaluate what is important to me and how I want to live my life. Organization is not something that comes naturally to me. A visit to my shop will make this obvious, yet in that small space where I work everything I need is close at hand and I feel comfortable, the kind of comfortable one feels when wearing a favorite old shirt. Before having to limit my time in the shop I was considering ways of organizing the shop and streamlining my workflow to increase productivity. This felt counterintuitive to my personality but getting out of one’s comfort zone is often a good idea. On the other hand, sometimes one’s comfort zone is just right the way it is. I am not a production oriented luthier. Before having to slow down I had found a comfortable rhythm of work and enjoyed it. Each time I tried to do more work than felt comfortable either the work suffered for it or I suffered for it. That is not how I choose to live. Rather than getting more work done circumstances have dictated I get less done. A positive aspect of this has been a chance to “enjoy the scenery” more while working. I have also had time to refine my dulcimer designs, improve some of my hand-tool skills, and study various lutherie traditions. As a result Spanish guitar construction techniques have greatly influenced my methods of work these past few years. Ironically, I have also found ways to streamline workflow and increase productivity! But really, the inspiration for this blog post is yet another upcoming adventure. In the middle of November I will be having back surgery number 3, a bi-level lumbar fusion that should help ease the most annoying aspects of what I have dealt with. I will not be able to work in the shop for several months following surgery and when I make my reentry I will be starting out slowly and gently. I’m sure the downtime during recovery will be yet another gift I would not have asked for! I was hesitant to go public with news of the upcoming surgery at this time but found I have already had to talk about it more than planned. 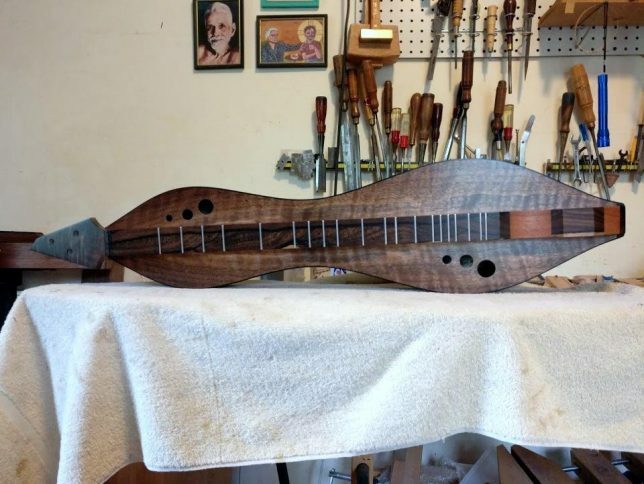 I have had to turn down gigs and tell people inquiring about ordering dulcimers that it will be some time before I will be able to make them. Once completely recovered I will most likely return to work full-time or something closer to full-time again. That alone will bring a great increase in productivity. I am very much looking forward to that! I love my job. I also hope to travel again and go to festivals, see friends in distant places, and leap tall buildings in a single bound. Working Away – More Dulcimers Coming Soon! Thanks for sharing – sometimes being way laid opens up other possibilities as you have found. I will keep you in my thoughts.
? ?Until you’re back to full time, more time at the water cooler talking to us? Or compiling a novel of your memoirs? Will be thinking of the relief after the process ahead for you! Thank you so much for the kind words. I’m sure I’ll be hanging out at the water cooler with my creativity enhanced by pain pills. That should be interesting! Currently getting things in order and preparing a nest so when this all happens in mid November everything is in place. Big hugs to you. Doug, you bring your readers and friends on social media much pleasure through your big hearted commentary and humor. Sending my best thoughts for a strong comeback. Thank for the kind words, Tico! Good luck and I hope the surgery goes well for you. More back surgery & a fusion, how lousy. But I know their techniques have improved a lot since my mother, your aunt Reva, had three such procedures. It would be nice if you could travel, maybe we will get to see each other again! Yes, I have inherited the Gitlin/Rakowitz spine! Once I’m healed up a trip East will certainly be in order and I look forward to seeing you!